Dredging sludge has negative connotations but the Marker Wadden shows that the natural and economic value of dredged material is underestimated. Sludge, silt and mud are useful raw materials and building materials. They can be used for upgrading soils, raising dikes, nature development or land reclamation. So the spotlights at the Innovation Expo in Amsterdam today will be on the Marker Wadden: a unique ecosystem that will boost biodiversity, improve water quality, and create space for leisure activities and scientific research. The Markermeer is one of the largest freshwater lakes in Western Europe. The ecology in the lake has declined severely since the creation of the IJsselmeer lake. By building islands, marshes and mud flats in the lake, the Dutch Society for the Preservation of Nature (Natuurmonumenten) and the Dutch government are working together on restoring natural values. That involves using the sludge and clay present in the lake. After the construction of a ten-hectare trial island in 2014, work began in the spring of 2016 on the creation of 600 hectares of marsh. The development of the Marker Wadden is being closely monitored to learn about building with sediment, in other words Building with Nature. Clay, peat and also extremely soft sediment are being used to create a productive marsh landscape in the Marker Wadden. From the outset, this valuable natural ecosystem will be open to leisure activities; other sustainable functions may be given a place in time. In this way, the Dutch tradition of land reclamation will acquire a new, sustainable, dimension. A lot of dredging goes on throughout the world. The dredged material from many projects could also be used for land reclamation elsewhere. This is expected to result in major cost savings in the long term. So if it turns out that the Marker Wadden can be successful using dredging for nature, the knowledge acquired about building with sediment in freshwater systems and, in the future, in salt lakes will have excellent export potential. That also implies acquiring an understanding of regulations and earning models. How can we create productive landscapes such as the Marker Wadden cost-effectively and sustainably using dredged material? How can the acquired knowledge from the Marker Wadden be used to upscale to 10,000 hectares elsewhere in the Netherlands and the rest of the world? 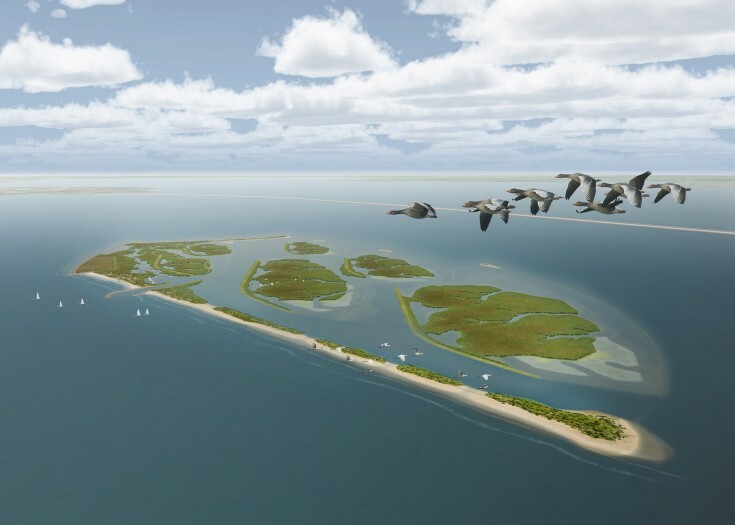 The Marker Wadden project is a joint venture of public and private parties, including the Dutch Society for the Preservation of Nature (Natuurmonumenten) and the national government. For more information: www.markerwadden.nl. Are you going to the Innovation Expo in Amsterdam today (Thursday, 14 April)? Follow the signs to the Waterplein and stop at stands 12 and 14 for the Marker Wadden and Building with Nature.